Golden snitch ring-box commission, designed and made by Christine Pedersen and Jeff de Boer. Chasing and repoussé, constructed. Height 30 cm. 2015. Portrait study in very high relief. Chasing and repoussé in brass. 4.5 inches tall. "Have posted a picture of my 17-piece chased picture installation at the Alberta Craft Council "Well In Hand" show: http://christinepedersen." 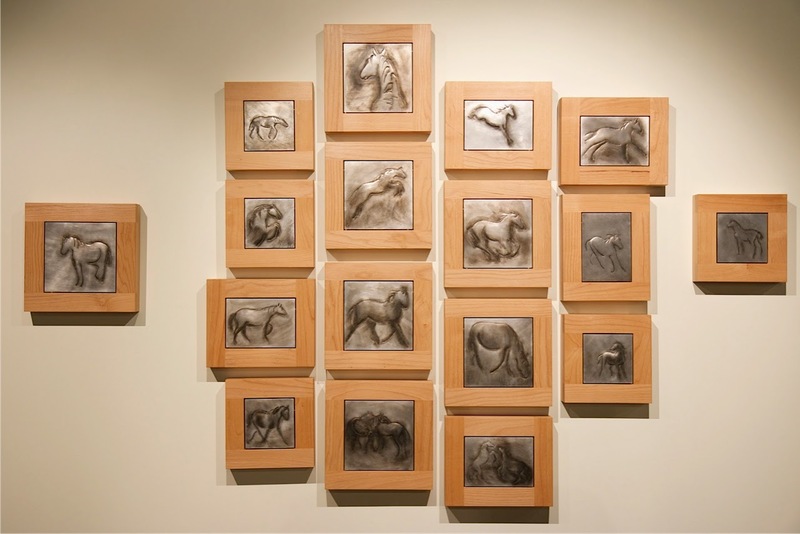 "New body of chased equine studies for the "Well In Hand" show, at the Alberta Crafts Council in Edmonton, from Oct 4 - Dec 24, 2014." "Hi Catherine, Thanks for getting in touch. I am a beginner in enamelling, but I know it is a process that I will be doing a lot more of... As a start, I have attached a photo of two pieces from my second year enamelling project at ACAD, Spring…"
Completed 4th year studio classes at ACAD in 2012 - hurray! I have a home studio and work in chasing, stone-setting, enamel, and small silver and metal work. I am an experienced ceramist, and am creating work that combines metal and ceramic elements. My ring design, The Specialist, was a finalist (top 4) in the 2012 Johnson Matthey design competition, in the "Palladium Expression" category. A collection of men's precious metal and gemstone pendant ties were selected for the Alberta Craft Council summer show "For The Love Of Craft", 2010. "Return" - new sculpture made with amazing artists Jeff de Boer and Cory Barkman, commissioned by Alberta Depot, includes a large amount of recycled materials. The piece will be going on tour all over Alberta to promote recycling beverage containers. Bluerock Gallery July 16/17 - I will have chased pictures - equine, abstract, maple leaves... Bluerock has so much gorgeous artwork to lust over - and it's close to two meaderies, makes for a fabulous day-trip! Hope to see you there. um well you are the only one to respond! thank you! I think everyone checks facebook more often! so not sure how we will all keep in touch, we started a links group that kinda got pushed aside due to school, so I hope to start that up again once I'm graduated!! we just need a good meeting place for everyone!